Are you fond of playing golf? If you are, then you must also use the golf cart to get around the course easily. No one wants to walk too far with all the heavy golf equipment at hand. Golf carts make it easy for golfers to navigate their way all over the course. But imagine if the battery of your golf cart goes flat while you are in the middle of a game? Isn’t that just inconvenient? If you think the battery is dead, don’t throw it away just yet. We’ll teach you how to recondition golf cart batteries in no time, so you don’t have to spend money buying a new one. The difference between the batteries of golf cars and that of other vehicles is that they do not need a lot of power. It just needs enough to work on smooth roads but for a longer time. The batteries used in the golf carts are mostly 6-volt lead batteries or 12-volt lead batteries. The life of these batteries is primarily low as they are mostly ignored. The improper storage and the way they are used also contribute to the battery’s short life. 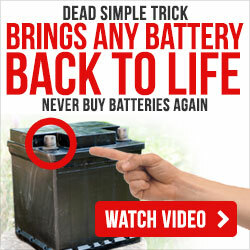 Most often these batteries, when not functioning properly, are thrown away. The better way to deal with them is to rejuvenate golf cart batteries as it will save a lot of costs and is also an environmentally friendly way to live. There are simple steps in which the golf cart batteries are rebuilt. These steps should be followed in the same sequence to gain the right amount of revived battery power. Step 1: The battery should be removed. Most of the cart batteries are placed under the front seat, and you will have to lift the seat up to remove the battery. This could be different for some other cart models who have a hinged seat which can be lifted straight to take the battery out. Step 2: Start with cleaning the battery. Clean all the corrosion off the battery. First, put on the gloves and the goggles and mix two tablespoons of baking soda into water. Stir the mixture well. Now, use a paintbrush and dip it in the mix. Use this brush and solution to paint all over the battery where there are signs of corrosion. Particular attention should be given to the terminals of the battery. Be careful as the mixture will generate bubble or fizz where the solution and the acid from the battery will come in contact. Step 3: Now, use the same brush to wash it with fresh water and brush it all around the battery. Go and clean the whole battery and wash away the entire corrosion from the battery. Step 4: The process to revive golf cart batteries advances with the inspection of the battery for any cracks or any defects. It is advised to replace the battery if there are signs of acid leaking into the battery compartment. Step 5: You now use a screwdriver and other tools for this step. Remove the cap that covers the battery cells. This could need a little pressure and push. To recondition the battery, the cap should be opened totally so that the distilled water can be filled in them. Fill the cell carefully with the help of a funnel. Step 6: Use the three-phase charger to charge the battery. The battery should be charged for about 12 hours. Make sure that you are using the right volt if it needs automatic setting set the voltage at 2.3 and 2.35-volt charge. Connect to charge. Carefully connect the positive wire to the positive pole on the battery and the negative charge to the negative pole on the battery. Plug it in and then switch it on for charging after it is safely connected to the battery. Step 7: Leave it for the night. Check the charging level in the morning. When the battery charges show that the battery has been charged fully. Check the cells and check if there are any cells where the battery plates are open to the air, and the water levels are low, refill these cells to cover the plates with enough water. Replace the caps on the cell and cover the battery again. If the outcome is that the battery is not fully charged and you must have to take an additional step. Step 8: The battery should be tipped on one of the edges. This is done let approximately half of the acid from the battery to drop out of from each cell. Make sure safety precautions are carefully followed, and the acid is collected in a container. Make use of the paint brush here which is dipped in the solution of soda as mentioned earlier. No drop of water should go inside the cells. Step 9: Now take about 8 ounces of Epsom salts and mix it well with 2 quarts of warm water. Make sure that it is stirred and dissolved completely. The cells should be filled with this solution until the cells are full and then cover them. (You can learn more about battery recondition with Epsom salt). Step 10: After these steps, charge the battery again for about a night. The salt used will remove any deposit on the plates of the battery which is the reason why the battery did not fully charge. After this step, the battery is ready to be used, and your golf cart can be up and running again. You will be excited to play a round of golf again when your golf cart is running with the help of this process. The steps on how to recondition a golf cart battery are easy. Just familiarize yourself with the steps we have mentioned above. Be sure to use gloves and goggle when performing the process so you will be protected from any harmful chemicals. If you are interested to know more about reviving any old batteries, send your email over, and we’ll share with you more helpful information that you can use anytime.